Perfect for heavy duty vehicles and equipment. For more information and to purchase please call 866-607-1785. Overseas shipments will require additional shipping charges. Please call our office at (415) 927-2577 to determine what those charges will be. Please click here for list of Installers by State. Manufacturer’s Warranty is for one full year. 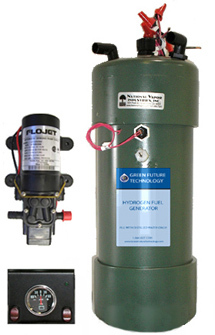 An extended warranty is also available for the Hydrogen Generator®. The extension is good for one full year and costs $200 for the 2.3 Liter unit and $500 for the 6.9 Liter unit. The extension goes into effect when the original warranty expires. If you would like to purchase this option or talk to our office about it, please call (415) 927-2577. 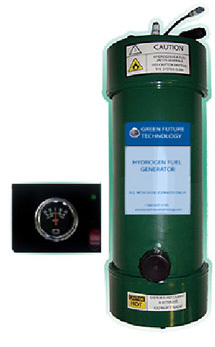 Thank you for considering the GFT Hydrogen Generator®. We know you will be completely satisfied with its performance and the savings it provides. Please tell others about our company when you have had an opportunity to evaluate the unit for yourself. how to prepare the Hydrogen Generator for shipment. If you are unable to find the answer you need in the printed documentation supplied with your product, you can contact us directly. Contact GFT customer support at (415) 927-2577. Warranty Upgrades : GFT offers a warranty upgrade option that extends your standard product warranty by one (1) year. This option includes priority return service and/or next business day exchange after receipt of a returned unit by GFT. The extension costs $200 for the 2.3 Liter unit and $500 for the 6.9 Liter unit. Typically, warranty coverage begins on the product purchase date and the upgrade option must be purchased within 90 days of that date. See the Web site Purchase Page to take advantage of this option. This warranty does not cover GFT products that have been remanufactured, reverse-engineered, cut or sawed into, misused, or tampered with in any way after purchase. 1. Manufacturer warrants to the end-user customer that the GFT products specified above will be free from defects in materials and workmanship for the duration specified above, which duration begins on the date of purchase by the customer. 2. GFT's limited warranty covers only those defects that arise as a result of normal use of the product, and does not cover any other problems, including those that arise as a result of improper maintenance or modification; the use of alternative parts or supplies not provided or supported by GFT; operation outside the product's specifications; unauthorized modification or misuse. 3. If product failure or damage is attributable to the use of a non- GFT replacement part, GFT will charge its standard time and materials charges to service the product for the particular failure or damage. 4. If GFT receives, during the applicable warranty period, notice of a defect in any product, which is covered by this warranty, the manufacturer shall either repair or replace the product, at GFT 's option. 5. If the manufacturer is unable to repair or replace, as applicable, a defective product, which is covered by this warranty, GFT shall, within a reasonable time after being notified of the defect, refund the purchase price of the product as long as the defect is reported to GFT within the Warranty Period. 6. GFT shall have no obligation to repair, replace, or refund until the customer returns the defective product to GFT. 7. Any replacement product may be either new or like new, provided that it has functionality at least equal to that of the product being replaced. 8. GFT products may contain remanufactured parts, components, or materials equivalent to new in performance. 9. GFT 's Limited Warranty Statement is valid in any country where the covered product is distributed by GFT. Contracts for additional warranty services, such as on-site service, may be available from any authorized GFT service facility in countries where the product is distributed by GFT or by an authorized importer. 10. GFT recommends that the customer retain the original packaging in which the GFT product was received. In the event a return of the product is required, use the original packaging to prevent product damage during shipment. 11. The expense of return postage or shipping from a customer to GFT shall be the responsibility of the customer. If applicable, GFT will pay postage or shipping costs to return a warranted replacement or repaired unit to the customer. Repaired units will be returned to fulfill the remainder of the unit s original warranty duration. 12. The GFT Hydrogen Generator is built to operate using only distilled water after an initial filling with mineral water in accordance with Instructions included with the unit. The use of lye, electrolytes, vinegar or substances other than distilled water and mineral water in accordance with included instructions, is strictly prohibited and will void this warranty. The only exception to this provision is the use of a 20 percent solution of denatured alcohol mixed with distilled water, to prevent Generator freeze-up during cold weather. 1. GFT products must be properly installed in order to function as designed. It is recommended that a certified vehicle mechanic perform installation. Every effort has been made to provide detailed installation instructions. These directions are packed with each unit and must be followed conscientiously to avoid installation errors that could cause a unit to malfunction. This warranty does not cover non-performance of units improperly installed. The installer is responsible to the customer for his/her installation and for correcting an improper installation. 2. Components shipped with an GFT product are warranted to perform as designed and are included in the warranty duration shown above. Defective components may be returned for immediate replacement anytime during the warranty period. 3. In the unlikely event there are missing parts or components that should have been included in an installation kit, those missing parts or components will be shipped by same-day mail upon notification to GFT. 4. All necessary parts and components required for routine installation in or near the engine compartment of a customer vehicle have been included in each GFT product installation kit. The cost of any extra wire, tubing, connectors or other miscellaneous parts and components required for an unusual installation, is the responsibility of the customer. 5. In the event that an GFT product cannot be installed in a customer vehicle for some reason, a unit with its complete complement of component parts, may be returned within 30 days after receipt (return postage/shipping paid by the customer) for a full refund, including original shipping cost and applicable sales taxes, less a 10 percent restocking charge based on the unit s original selling price. The Generator must be returned in near new condition in the unit s original packaging. Slight blemishes and component modifications (wire, tubing, etc.) caused by a failed installation will be accepted. 6. Units purchased from and installed by an authorized GFT distributor/agent, are warranted by the distributor/agent in the same manner as a unit purchased directly from GFT, except, customer complaints concerned with installation problems or product defects must be processed by the distributor/agent who will then work with GFT to obtain replacement parts or repairs. The distributor/agent is solely responsible for correcting malfunctions due to improper installation. C. Limitations of Warranty â€¨TO THE EXTENT ALLOWED BY LOCAL LAW, NEITHER GFT , THE MANUFACTURER NOR ITS THIRD PARTY SUPPLIERS MAKES ANY OTHER WARRANTY OR CONDITION OF ANY KIND, WHETHER EXPRESS OR IMPLIED WARRANTIES OR CONDITIONS OF MERCHANTABILITY, SATISFACTORY QUALITY, AND FITNESS FOR A PARTICULAR PURPOSE. ACCIDENTAL DAMAGES TO A CUSTOMER VEHICLE DURING THE INSTALLATION PROCESS, IS NOT COVERED BY THIS WARRANTY. TO THE EXTENT ALLOWED BY LOCAL LAW, EXCEPT FOR THE OBLIGATIONS SPECIFICALLY SET FORTH IN THIS WARRANTY STATEMENT, IN NO EVENT SHALL GFT , THE MANUFACTURER OR ITS THIRD PARTY SUPPLIERS BE LIABLE FOR DIRECT, INDIRECT, SPECIAL, INCIDENTAL, OR CONSEQUENTIAL DAMAGES, WHETHER BASED ON CONTRACT, TORT, OR ANY OTHER LEGAL THEORY AND WHETHER ADVISED OF THE POSSIBILITY OF SUCH DAMAGES. 1. This Warranty Statement gives the customer specific legal rights. The customer may also have other rights, which vary from state to state in the United States, from province to province in Canada, and from country to country elsewhere in the world. 2. To the extent that this Warranty Statement is inconsistent with local law, this Warranty Statement shall be deemed modified to be consistent with such local law. Under such local law, certain disclaimers and limitations of this Warranty Statement may not apply to the customer. For example, some states in the United States, as well as some governments outside the United States (including provinces in Canada), may preclude the disclaimers and limitations in this Warranty Statement from limiting the statutory rights of a consumer (e.g., the United Kingdom); otherwise restrict the ability of a manufacturer to enforce such disclaimers or limitations; or grant the customer additional warranty rights, specify the duration of implied warranties which the manufacturer cannot disclaim, or allow limitations on the duration of implied warranties. 3. THE TERMS IN THIS WARRANTY STATEMENT, EXCEPT TO THE EXTENT LAWFULLY PERMITTED, DO NOT EXCLUDE, RESTRICT, OR MODIFY, AND ARE IN ADDITION TO, THE MANDATORY STATUTORY RIGHTS APPLICABLE TO THE SALE OF GFT PRODUCTS TO SUCH CUSTOMERS. You will find below the name and address of the GFT entity responsible for the performance of the GFT Limited Warranty. You may have additional statutory rights against the seller based on your purchase agreement. This GFT Limited Warranty does not in any way affect those rights. Green Future Technology, 12 Skylark Dr., #33, Larkspur, CA 94939, 415-927-2477.